Marquis Ōkuma Shigenobu (大隈 重信) (February 16, 1838 – January 10, 1922) was a popular Japanese statesman and politician, the eighth (June 30, 1898–November 8, 1898) and seventeenth (April 16, 1914–October 9, 1916) Prime Minister of Japan, and the founder of Waseda University. His father was a soldier and wanted him to pursue a military career, but Shigenobu became interested in politics at an early age. He studied rangaku (Dutch, or Western studies) and learned English and international law from a Dutch missionary, becoming a strong advocate of constitutional government. As a young man he sympathized with the doctrine of sonno joi ("revere the emperor and expel the barbarians"), and supported a policy of unity between the imperial court and the shogunate. He was an active participant in the Meiji Restoration, and became Finance Minister in the new government, responsible for the modernization of Japan’s fiscal system and the implementation of reforms that aided Japan's early industrial development. In 1881, after a long series of disagreements with the Meiji oligarchy, Ōkuma was dismissed. He went on to become an eloquent and respected critic of the government. In 1882, he co-founded the Constitutional Progressive Party (Rikken Kaishinto) to promote the concept of a British-style parliamentary system. The same year, Ōkuma also founded the Tokyo Senmon Gakko in the Waseda district of Tokyo, which became Waseda University. In 1898, he organized the Kenseito party and became prime minister. He retired from politics in 1907, but returned and became prime minister again in 1914. Okuma was instrumental in the modernization of Japan by instituting social, cultural, political, and economic reforms. He was one of the most highly respected politicians in Japanese history. 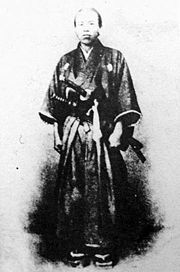 Ōkuma Shigenobu was born "Hachitarō," the first son of an artillery officer who was a samurai of the Saga clan, in Saga, Hizen Province (modern-day Saga Prefecture) on February 16, 1838. Although his father, a solder, wanted him to pursue a military career, Okuma was interested in politics. During his early years, his education consisted mainly of the study of Chinese Confucian literature and derivative works, such as Hagakure. In 1855, shortly after his father's death, he abandoned his studies at the domain academy and moved to a school of rangaku (Dutch studies, or Western studies). The Dutch school was merged with the provincial school in 1861, and Ōkuma took up a lecturing position there shortly afterward. Although Ōkuma sympathized with the sonnō jōi (“revere the emperor and expel the barbarians”) movement, he also advocated mediation between the rebels in Chōshū and the Shogunate in Edo. During a trip to Nagasaki, Ōkuma met a Dutch missionary named Guido Verbeck, who taught him the English language, mathematics, and international law, and provided him with copies of the New Testament and the American Declaration of Independence. These works are often said to have affected his political thinking profoundly, and encouraged him to support efforts to abolish the existing feudal system and work toward the establishment of a constitutional government. Ōkuma frequently traveled between Nagasaki and Kyoto in the following years and became active in the Meiji Restoration. He was a member of the imperial loyalist faction within Hizen, and supported the policy of unity between the imperial court and the shogunate. In 1867, he traveled to Edo with Soejima Taneomi to propose an imperial restoration plan to Shogun Tokugawa Yoshinobu; the Shogun responded by declaring the men ronin and ordered them arrested as they proceeded back to Kyoto. Ōkuma spent a month under house arrest in Saga. After the Meiji Restoration reestablished the political power of the emperor, leaders of the Meiji government broadened their base of support by adding representation from Saga. Okuma’s Western knowledge, ability, and forceful personality soon earned him a position as an official of the new government. He made use of his close contacts with Inoue Kaoru to secure a position in the central government in Tokyo. Following the Boshin War in 1868, Okuma was placed in charge of foreign affairs for the new Meiji government, and was soon given an additional post as head of Japan's monetary reform program. In 1869, he became chief secretary in the Ministry of Finance, and was mainly responsible for the modernization of Japan’s fiscal system, instituting property and taxation reforms that aided Japan's early industrial development. In 1870, he became a sangi (councillor) in the first Diet of Japan, and in 1873, was appointed Minister of Finance. In 1876, he converted all samurai stipends into a lump sum payment, relieving the young Meiji state of a great financial burden. He also unified the nation’s currency, created the national mint, and instituted a separate Ministry of Industry. In 1881, members of the government were asked to propose provisions for a new Japanese constitution. Okuma startled his colleagues by urging the government to hold elections the next year and establish a parliament and a cabinet responsible to the parliament, similar to the British system. That same year, he was dismissed after a long series of disagreements with members of the Satsuma and Chōshū clique (hambatsu) and the Meiji oligarchy, most notably Itō Hirobumi, over his efforts to secure foreign loans, and especially over his exposure of illicit property dealings in Hokkaido involving Prime Minister Kuroda Kiyotaka and cronies from Satsuma. The movement for a new constitution, however, continued to gain impetus, and as a result of popular pressure, the emperor promised that one would be ratified by 1890. It was completed a year earlier, on February 1, 1889. In 1882, Ōkuma co-founded the Constitutional Progressive Party (Rikken Kaishinto, a forerunner of the Minseito) to promote the concept of a British-style parliamentary system. It soon attracted a number of other leaders, including Ozaki Yukio and Inukai Tsuyoshi. Okuma lost some popularity and credibility when it was revealed that he was connected with the Mitsubishi zaibatsu. In 1882, Ōkuma also founded the Tokyo Semmon Gakko in the Waseda district of Tokyo. The school later became Waseda University, one of the country's most prominent institutions of higher education. Despite their continuing animosity, Itō again appointed Ōkuma to the post of Minister for Foreign Affairs in February 1888, to deal with the difficult issue of negotiating revisions to the "unequal treaties" with the Western powers. The treaty he negotiated was perceived by the public as too conciliatory to the Western powers, and created considerable controversy. Ōkuma was attacked by a member of the Genyosha in 1889, and lost his right leg when a bomb exploded near him. He decided to retire from politics at that time. He returned to politics again in 1896, by reorganizing the Rikken Kaishinto into the Shimpoto (Progressive Party). In 1897, Matsukata Masayoshi convinced Ōkuma to participate in his second administration as Foreign Minister and Agriculture and Commerce Minister. He managed to revise the unequal treaties, but remained in office for only one year before resigning. In June of 1898, Ōkuma co-founded the Kenseito (Constitutional Government Party), by merging his Shimpoto with Itagaki Taisuke's Jiyuto, became Prime Minister, and was appointed by the Emperor to form the first bipartisan cabinet in Japanese history. The new cabinet survived for only four months before it fell apart due to internal dissension. Ōkuma remained head of the party until 1908, when he retired from politics. After his political retirement, Ōkuma became president of Waseda University and chairman of the Japan Civilization Society. He translated a number of European and American texts into Japanese, and gathered support for Japan's first expedition to Antarctica. Ōkuma returned to politics as Prime Minister during the constitutional crisis of 1914, when the government of Yamamoto Gonnohyoe was forced to resign in the wake of a scandal in which it was discovered that the German company, Siemens, had been paying kickbacks to the Japanese navy in exchange for lucrative contracts. 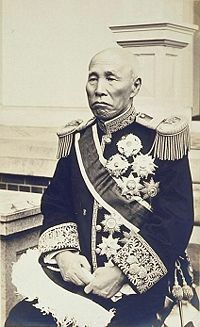 Okuma organized his supporters, together with the Rikken Doshikai and Chuseikai organizations, into a coalition cabinet. The second Okuma administration was noted for its active foreign policy. Later that year, Japan declared war on Germany, entering World War I on the Allied side. In 1915, Okuma and Kato Takaaki drafted the Twenty-One Demands on China. Ōkuma’s second administration was also short-lived, though Japan enjoyed an economic boom because of the activity generated by World War I. Following the Oura scandal, Ōkuma's cabinet lost popular support, and its members resigned en masse in October 1915. In 1916, after a long argument with the genro, Ōkuma also resigned, and retired from politics permanently. Ōkuma returned to Waseda, and died there in 1922. Thee hundred thousand people attended his state funeral in Tokyo's Hibiya Park. He was buried at the temple of Gokoku-ji. This page was last modified on 14 February 2015, at 22:45.